Looking for a Used Mirai in your area? CarGurus has 117 nationwide Mirai listings starting at $13,995. The automotive landscape is arguably undergoing some pretty serious change. The auto industry must look pretty unfamiliar to anyone who thinks hybrids and electric cars are still novelties, now that nearly every automaker offers an alternate-fuel vehicle of some kind. Toyota, which was a pioneer in the hybrid segment with its Prius, is now once more paving the way with the Mirai fuel cell vehicle (FCV). The Mirai is not the first FCV on the market, but it appears to be the most consumer-friendly and mass-market-ready of all FCVs on sale to date. “Mirai” means “Future” in Japanese, which would seem to be an appropriate name, as the Mirai will likely signal the future for FCVs in Toyota's eyes and in those of the auto industry as a whole. FCVs are basically hybrids that utilize hydrogen fuel, which is stored in self-sealing tanks. When the vehicle's in motion, the hydrogen reacts with the fuel cell to create electricity that powers an electric motor, producing 152 hp and 247 lb-ft of torque sent to the front wheels. Given that it is basically a 1-gear synchronous electric motor, the Mirai's powerplant will probably offer a driving experience similar to a vehicle outfitted with a continuously variable transmission: you just put it in drive and go. The best part of it all is there are no emissions--the only byproduct is water! Fuel is delivered into the two fuel tanks at 10,000 psi. Filling the tanks gives the Mirai an estimated range of 270 miles, which will remain crucial while automakers and energy companies develop a better infrastructure of hydrogen fueling stations. Doing so will take some time, and as of now the most comprehensively covered region is southern California, with the only hydrogen-fuel stations in other regions currently belonging to commercial businesses. The EPA rates the Toyota Mirai at 66 MPGe or miles-per-gallon-equivalent. You’ll have to watch the fuel prices for hydrogen closely, as they're currently positioned more for commercial/bulk use. The Mirai's interior is more in line with contemporary Toyota cabin design, but when you have cars like the Prius leading the way, the design status quo is a little more “out there” than with other brands. Like the Prius, the Mirai features a center-dash instrument panel that does away with the traditional gauge cluster positioned in front of the steering wheel. Anyone who's owned a Prius might already be used to the unconventional dash layout, but it will take some getting used to otherwise. The Mirai features touch-capacitive controls for the climate control, which could also be a little confusing. And there's a separate touchscreen on the center stack that controls the stereo and navigation systems, and which features Toyota’s Entune system with a robust suite of in-car apps. There may be concerns about the use of hydrogen as a fuel source, but Toyota has gone to great lengths to minimize danger in case of an accident. The storage tanks themselves are designed not to leak, and in the event of a collision, the hydrogen fuel lines stop pumping and the tanks seal off. The Mirai also benefits from Toyota's full suite of passive and active high tech safety features. The 2016 Toyota Mirai starts at $58,325. That may seem like a lot, but such is the price of being an early adopter of a new technology. It will be quite some time even before Toyota sees a profit on any of these vehicles. However, the Japanese manufacturer is taking good care of early FCV customers: new Mirais come with a substantial support program that includes three years of complementary fuel, no-cost maintenance for three years or 35,000 miles, and an impressive 8-year, 100,000-mile fuel-cell powertrain warranty. For somewhere in the neighborhood of $60,000, you can be on the leading edge of a new technology. It might not be the most convenient option for a daily commuter, and maybe not even a viable one yet, depending where you live. But for those who live in the right market with the right infrastructure, the Mirai represents a chance to be one of the first drivers to take a step in a whole new direction for the automobile. 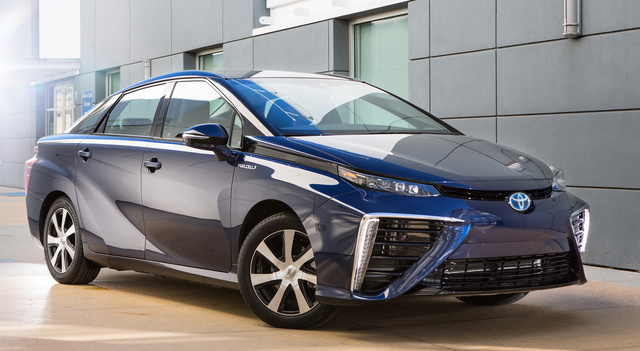 What's your take on the 2016 Toyota Mirai? Have you driven a 2016 Toyota Mirai?